ENO Moonshine Lantern. Illuminate your night with the Moonshine Lantern. 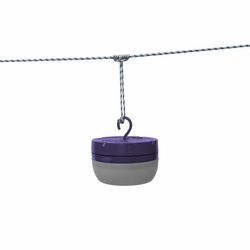 Hang this versatile, compact light from your ridgeline, set it flat on your camp table, or hand-hold to show the way with a continuous warm glow. Powered by 3 AAA batteries and strong LED bulbs that shine in 4 lighting modes (60 lumen white, dim for longer battery life, color for softer lighting, strobe to get the party started), the Moonshine is a lot of light in a little package. Eagles Nest Outfitters.